Saturday afternoons usually find me trawling the charity shops looking for some elusive paperback. I never bother looking at the CDs - the number of review CDs I receive take up all of my listening hours. I rarely have the opportunity to play the ones I want to play let alone buy new ones. However, today, in the Marie Curie shop in Jarrow's Viking Precinct, I glanced at them and I couldn't believe my eyes - Bobby Hackett - At the Jazz Band Ball 1938-1940. £1! "Good grief!" I cried. 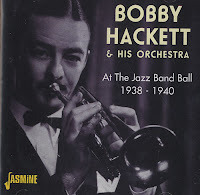 Not only was Bobby Hackett in the box on the shop floor but also CDs by Ellington, Basie, Don Redman, Luis Russell, Chet Baker, Red Allen, Slim Gaillard, Memphis 5, Nat Cole and others. I was tempted to buy the lot but, realising I'd never find the time to play them, I stuck with Bobby Hackett. It's an absolute gem. He's with the Condon gang on most of the tracks, there's also a couple of Maxine Sullivan vocals as well as some big band tracks - I didn't even know he'd led a big band! Apparently it didn't last long, Hackett, it would seem, didn't have the cold, business approach that Miller, Goodman and the Dorsey brothers had. Miller actually employed Hackett as a guitarist although he did unstring him for that memorable String of Pearls solo. Possibly the best solo ever in Miller's civilian band. Certainly the one that every trumpet player of a certain age knows by heart - a bit like the High Society clarinet chorus! Listening to his cornet playing it isn't hard to see the link he provided between Bix and Chet. All three had a rare lyricism. So I bought it - for 50p! They must have been having a sale! I may be back tomorrow - they open Sundays although possibly not Easter ones! And of course he did the superb "solo" on Tony Bennett's "The very thought of you"
Lucky it was a CD and not vinyl - probably would not have been playable!! Hey Hugh - ain't nothing wrong with vinyl, the sound is better and you can read the liner notes without a magnifying glass! Miles Ahead at Tyneside Cinema! Ray Dales Quartet @ Ashington Jazz Club. CD Review: Darren English - Imagine Nation. New release :Magnus Öström - Parachute. CD Review: Phronesis - Parallax. BSH Talks to Alex Webb about Café Society Swing. CD Review: Marcos Varela - San Ygnacio. The Jazz Clams @ The Globe - March 10. Jazz Café Jam - March 1.